FIFA’s crusade against video technology could get this official into trouble. 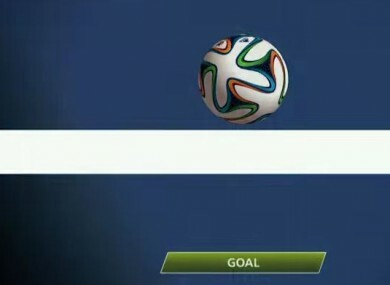 FIFA allowed goal-line technology to be brought in during the World Cup. A TOP ARGENTINE referee is facing a ban after scrapping a penalty and a red card after consulting with a linesman alleged to have seen the incident in slow motion on a television screen. Video replays are not allowed by world soccer’s governing body FIFA and the Argentine Football Association (AFA) will examine the incident on Tuesday. During an Argentine league clash at the weekend between Velez Sarsfield and Arsenal, match official German Delfino, considered one of South America’s top referees, awarded Velez a penalty and sent off Arsenal defender Daniel Valencia for handling the ball in the box. However a television replay showed the ball was actually touched by a Velez player and not Valencia. Delfino, 36, tipped as a refereeing official for the Copa America which begins in June, apologized after the game for initially getting the decision wrong. It did not, however, prevent Velez from winning the match 2-1. “This type of action is difficult to judge. The refereeing team worked well and justice was done,” said Miguel Scime, head of referee training in the Argentine league. “Delfino assured me that he didn’t base his decision on the technology but what his assistants’ saw,” said Scime. “You can’t deliver justice as you want,” said Guillermo Marconi, of the Argentine Referees Union. Despite being cleared of the handball Colombian defender Valencia was sent off later in the match. Email “Sepp Blatter will be delighted to learn of this referee's punishment for using video technology ”. Feedback on “Sepp Blatter will be delighted to learn of this referee's punishment for using video technology ”.